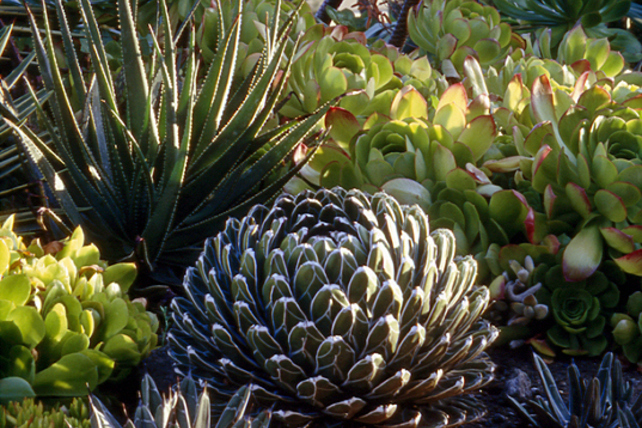 Our very first preservation garden, located in Walnut Creek, in California’s Ygnacio Valley, the Ruth Bancroft Garden is recognized as one of America's finest examples of a dry garden. 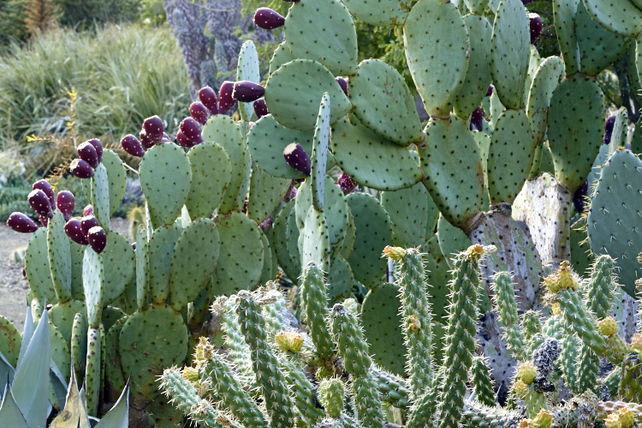 It features a variety of rare and extraordinary succulents and cacti and has a year-round presence, coming in and out of bloom and coloration as if the plants were absorbed in a fascinating conversation with each other. 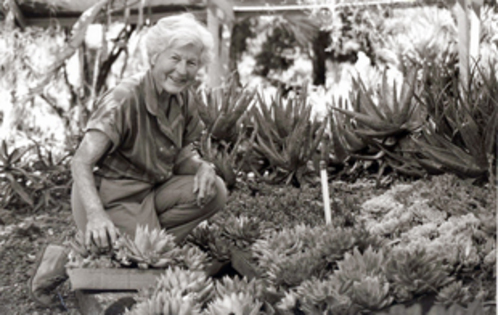 On February 17, more than 800 people gather at the Ruth Bancroft Garden for an all-day event in celebration of Ruth Bancroft's life and legacy. The Ruth Bancroft Garden announced the death of Ruth Bancroft on November 26, at the age of 109 years. 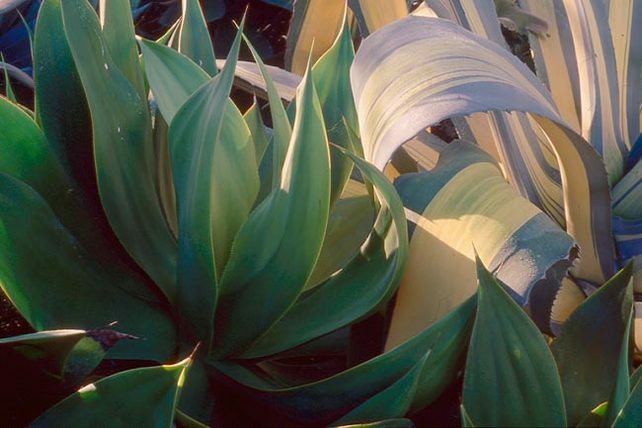 A visit to Ruth's garden inspired Frank Cabot to create the Garden Conservancy in 1989. Her legacy continues to inspire people across the country and will live on in many ways, as described in a short tribute video made by the Ruth Bancroft Garden. The garden broke ground for a new Visitor and Education Center on August 19. The January 2017 edition of the UK Royal Horticultural Society's monthly magazine, The Garden, includes a nice book review of The Bold Dry Garden. Earlier in January, the book was also reviewed in Pacific Horticulture magazine and the East Bay Times reported that the "Bancroft Garden preps for major upgrade." Ruth Bancroft Garden receives challenge grant from the Garden Conservancy and groundbreaking for Visitor and Education Center is scheduled for 2017. 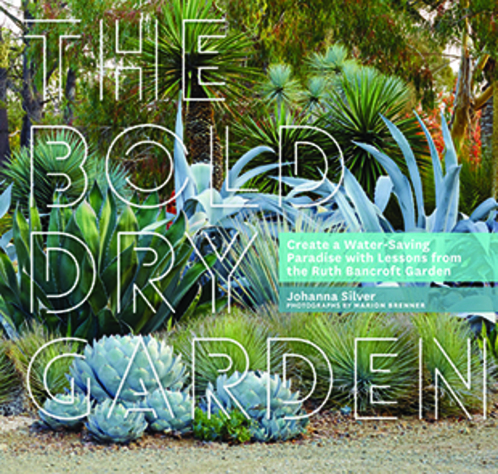 In September, Timber Press publishes The Bold Dry Garden: Lessons from the Ruth Bancroft Garden. Visitor and Education Center designed. Capital campaign launches, raising money for construction. Ruth Bancroft receives a "Women Preserving the Environment" award from the Contra Costa Commission for Women. 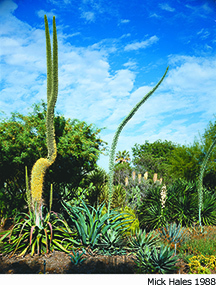 Ruth Bancroft turns 100 years old, and the Ruth Bancroft Garden celebrates this milestone with a year of special events. Our Marco Polo Stufano Fellow, Becky Rice, studies with Bancroft and becomes the garden's executive director in 2005. Ownership of the garden is transferred to the new nonprofit, Ruth Bancroft Garden, Inc.
Tours are open to the public on a limited basis. More than 6,000 people visit the garden annually in the next few years. The Garden Conservancy is also granted a conservation easement, the first used to protect a private garden. 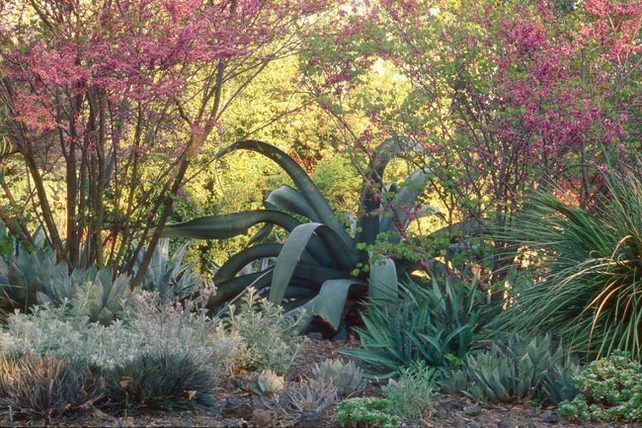 The Garden Conservancy and the Bancroft Garden launch a "friends" organization to raise money for preservation and maintenance. 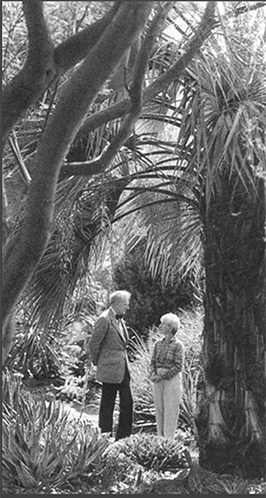 At the suggestion of acclaimed garden writer Penelope Hobhouse, Frank and Anne Cabot visit the Bancroft Garden, which inspires the formation of the Garden Conservancy. The "Big Freeze" of December 1972 kills most of Bancroft's garden. Undaunted, she starts over. All but 3 acres of the original orchards are cut down and lost to sub-division; the remainder becomes the Ruth Bancroft Garden. Lester Hawkins, co-owner of Western Hills Nursery, is retained to design the layout of the garden, the paths, and the mounds. Bancroft begins to plant a great number of small succulents and even some palm trees. Ruth Bancroft buys and plants her first succulent, an Aeonium 'Glenn Davidson', which still grows. Ruth Petersson marries Phillip Bancroft, Jr. and moves to the family farm. Historian and publisher Hubert Howe Bancroft begins farming walnuts and prize-winning pears on the 400-acre property. Passed down through three generations, the farm remains in operation until the late 1960s. 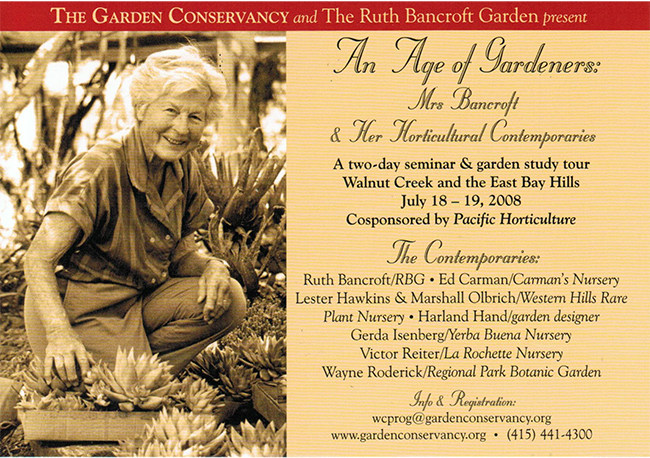 Ruth Bancroft was a pioneer in dry gardening. 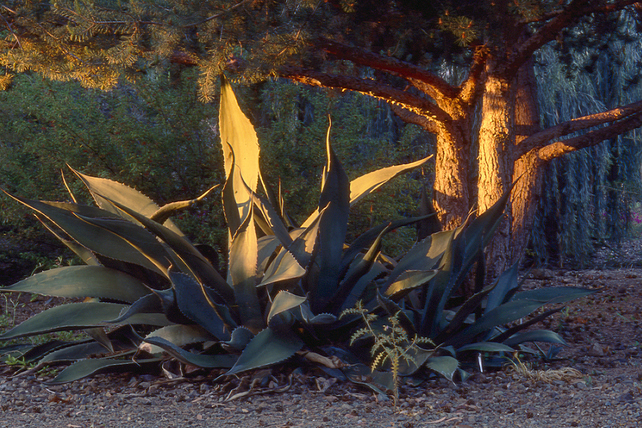 Today dry gardening is more important than ever in California—just one example of the importance of preservation.